By improving the health of the global population and saving millions of lives in a cost-effective manner, vaccines represent an important milestone in the trajectory of medicine and healthcare more broadly.4 However, despite the unmistakably positive impact that vaccines have had on public health, several notable gaps in knowledge and barriers to access limit their potential in the healthcare spectrum. Rates of adult vaccination are far below recommended levels, while community pharmacies, despite offering convenient and potentially cost-effective means for vaccination, remain underused sources of vaccine administration. Overcoming these challenges requires health systems, payers, and regulatory groups to take significant steps to boost education and awareness efforts and increase access to vaccine coverage. This article examines current reported vaccine rates and potential population health strategies to improve overall coverage. Despite recommendations that adults receive routine vaccinations throughout their lives, rates of adult vaccination in the United States are low. Every year, at least 45,000 adults in the United States die from vaccine-preventable diseases.8 Patients who go without routine or recommended vaccinations cost the United States health system approximately $10 billion per year.8 Moreover, although the majority of people who die from vaccine-preventable infections had visited their healthcare provider in the year before their death, they still were not vaccinated.9 This finding further highlights the susceptibility of American adults to deadly diseases based on the inadequacy of the current vaccination rates. Importantly, 2 types of HPV are responsible for 70% of cervical cancers and precancerous cervical lesions,18 both of which can be prevented by the vaccine. 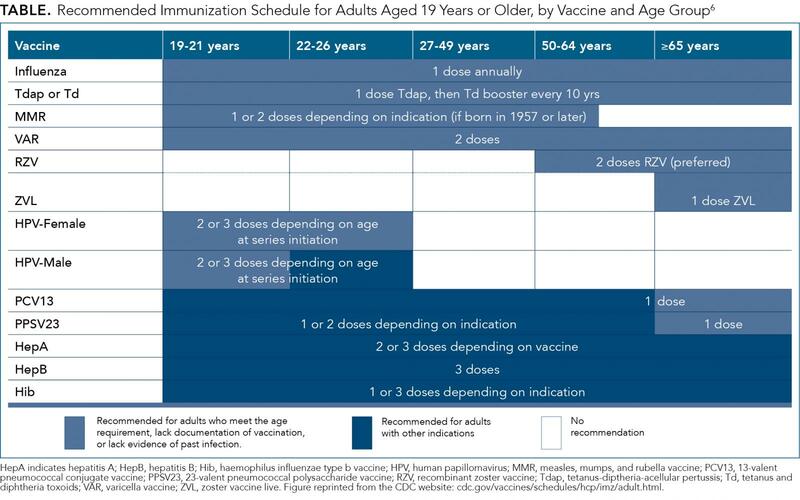 The ACIP recommends all adults to get the Td vaccine with boosters every 10 years.28 People 11 years of age or older who have not received the Tdap vaccine, or with an unknown status, should receive 1 dose of Tdap followed by a Td booster every 10 years, the guidelines state.